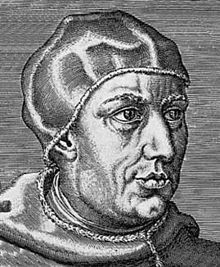 Michael Stifel or Styfel (1487 – April 19, 1567) was a German monk, Protestant reformer and mathematician. He was an Augustinian who became an early supporter of Martin Luther. He was later appointed professor of mathematics at Jena University. Michael Stifel's Arithmetica Integra (1544), p. 225. Stifel was born in Esslingen am Neckar. He joined the Order of Saint Augustine and was ordained a priest in 1511. Tensions in the abbey grew after he published the poem Von der Christförmigen, rechtgegründeten leer Doctoris Martini Luthers (1522, i.e. On the Christian, righteous doctrine of Doctor Martin Luther) and came into conflict with Thomas Murner. Stifel then left for Frankfurt, and soon went to Mansfeld, where he began his mathematical studies. In 1524 upon a recommendation by Martin Luther, Stifel was called to the Jörger on Tollet Palace in Tollet close to Grieskirchen, Upper Austria. Due to the tightened situation in Austria (execution of Leonhard Kaiser in Schaerding), Stifel returned to Wittenberg in 1527. At this time Stifel started writing a book collecting letter transcripts of Martin Luther. It was completed in 1534. By intercession of Martin Luther, Stifel became minister in Lochau (what is Annaburg now). Luther also confirmed the marriage of Michael Stifel and the widow of his predecessor in the ministry. Michael Stifel was fascinated regarding the properties and possibilities of numbers. At Lochau he had the opportunity to do mathematical studies on number theory and numerology. He also performed the so-called "Wortrechnung" (i.e. word-calculation), studying the statistical properties of letters and words in the bible, a common method at that time. In 1532 Stifel published anonymously his "Ein Rechenbuchlin vom EndChrist. Apocalyps in Apocalypsim" (A Book of Arithmetic about the AntiChrist. A Revelation in the Revelation). This predicted that Judgement Day the world would end at 8am on October 19, 1533. The German saying "to talk a Stiefel" or "to calculate a Stiefel" (Stiefel is the German word for boot) meaning to say or calculate something based on an unusual track can be traced back to this incident. When this prediction failed, he did not make any other predictions. In 1535 he became minister in Holzdorf near Wittenberg and stayed there for 12 years. Stifel now continued with serious mathematical studies. Worth mentioning were "the Coss" (the first algebra book written in German) of Christoph Rudolff, which he did in self study and "the Elements" of Euclid in the Latin edition by Campanus of Novara. A proposal of Jacob Milich, who supported his scientific development. Milich encouraged Michael Stifel to write a comprehensive work on arithmetic and algebra. In 1541, during his time as minister in Holzdorf, he also registered for mathematics at the University of Wittenberg to extend his mathematical knowledge. In 1558 Stifel became first professor of mathematics at the new founded University of Jena.
. The book contains a table of integers and powers of 2 that some have considered to be an early version of a logarithmic table. Stifel explicitly points out, that multiplication and division operations in the (lower) geometric series can be mapped by addition and subtraction in the (upper) arithmetic series. On the following page 250, he shows examples also using negative exponents. He also realized that this would create a lot of work. So he wrote, that regarding this issue marvelous books could be written, but he himself will refrain and keep his eyes shut. Stifel was the first, who had a standard method to solve quadratic equations. He was able to reduce the different cases known to one case, because he uses both, positive and negative coefficients. He called his method/rule AMASIAS. The letters A, M, A/S, I, A/S each are representing a single operation step when solving a quadratic equation. Stifel, however avoided to show the negative results. Another topic dealt with in the Arithmetica integra are negative numbers (which Stifel calls numeri absurdi). Negative numbers were refused and considered as preposterous by the authorities at that time. Stifel however, used negative numbers equal to the other numbers. He also discussed the properties of irrational numbers and if the irrationals are real numbers, or only fictitious (AI page 103). Stifel found them very useful for mathematics, and not dispensable. Further issues were a method of calculating roots of higher order by using binomial coefficients and sequences. ^ Michael Stifel (1544). arithmetica integra. Johann Petreium, Nuremberg. p. 237. ^ Michael Stifel (1544). arithmetica integra. Johann Petreium, Nuermberg. p. 249B. ^ Walter William Rouse Ball (1908). A short account of the history of mathematics. Macmillan and Co. p. 216. ^ Vivian Shaw Groza and Susanne M. Shelley (1972). Precalculus mathematics. 9780030776700. p. 182. ISBN 978-0-03-077670-0. ^ Michael Stifel (1544). arithmetica integra. Johann Petreium, Nuremberg. p. 240B. ^ Bertram Maurer (1999). Abhandlung über Leben und Werk Stifels / scientific paper regarding life and work of Michael Stifel (in german). Kolping-Kolleg Stuttgart. Stifel, Michael (1544). 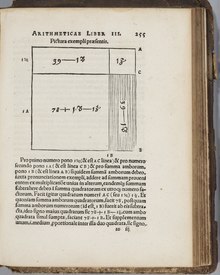 "Arithmetica integra"
Stifel, Michael (1544). "Arithmetica integra"/"Vollständiger Lehrgang der Arithmetik". German translation by Eberhard Knobloch and Otto Schönberger, Königshausen & Neumann, Würzburg 2007, ISBN 978-3-8260-3561-6. Anon. (Stifel, Michael) (1532). "Ein Rechenbuchlin vom EndChrist. Apocalyps in Apocalypsim" (A Book of Arithmetic about the AntiChrist. A Revelation in the Revelation). Koetsier, Teun and Karin Reich (2005). Michael Stifel and his numerology. pp. 291–310 in Koetsier and Bergmans (2005). Koetsier, Teun and Luc Bergmans (2005). Mathematics and the Divine: A Historical Study. Elsevier. Wikimedia Commons has media related to Michael Stifel.